One of the best New Year’s I ever spent was in a snowy Central Park watching fireworks shoot up above nearby Times Square, ushering in 2009 with Charlotte and a group of her Parisian friends who were visiting at the time. Although back then I hardly knew those people and could barely speak French, sharing the night with foreign first-timers is what made the night memorable. Exactly two years later to the day we got a last-minute dinner invite by two of the friends from that ‘09 clan, the same couple we helped move during our busy Best Bathroom Break Ever weekend. 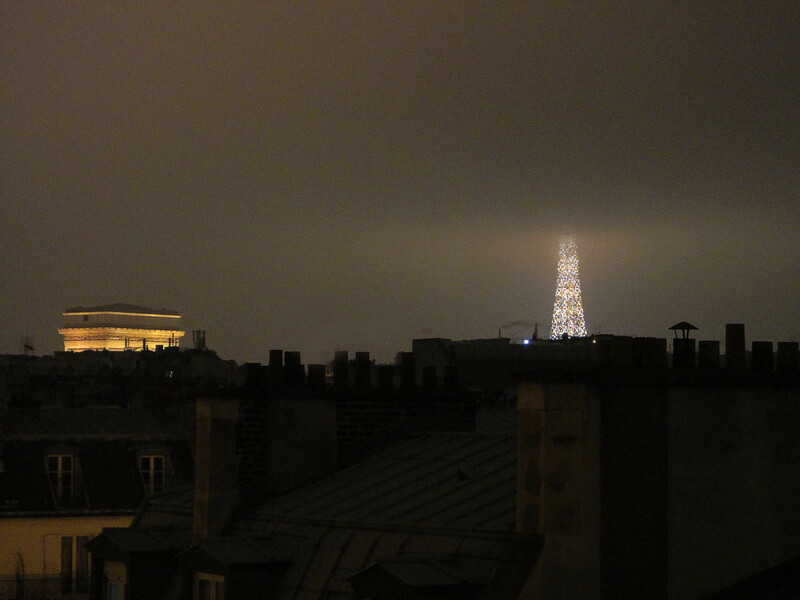 Even though one of them was a bit malade (sick) they offered to throw together a simple meal and watch the Eiffel Tower’s first shimmer of 2011 from their balcony. With both the friendship and my French having benefited from those extra two years since, checking the yes box on this one was a no-brainer. Thirty minutes later in the dining room I had to grab the camera as dinner was being served. 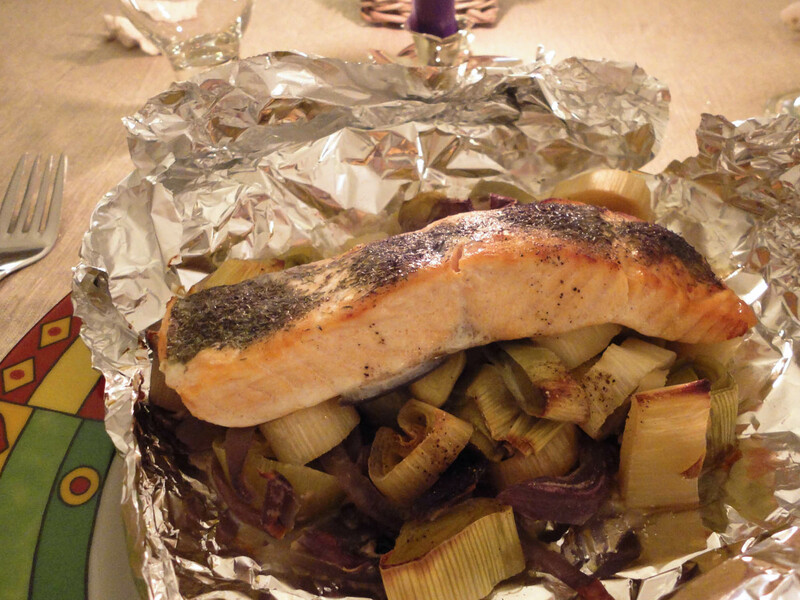 This supposed “très simple” dinner our friends had thrown together was salmon on a bed of roasted leeks and red onions with a side of truffle mashed potatoes. I heard some part of my body scream “Vive la France!” — it was either my soul or just my stomach but it didn’t really matter. And it was all going down beautifully with that white wine that certainly was much more than just champagne without bubbles (I really should go back and delete that). A cheese plate followed the main course like it always does, and I fell in love with all five of them. Even with my staunch anti-stinky bias in regards to the fromage spectrum I’m amazed at all the variations of texture, aroma, flavor, and color. I’m always that guy freezing outside the shop with my forehead pressed against the glass admiring the piles of wheels, blocks, logs, and pyramids trying to guess which one I’d like best. God help my colon if I ever get wealthy enough to make all these lactose fantasies come true. The history of Paris is so jam-packed with amazing dates — kings, castles, wars, masterpieces of art and architecture – one heck of a list. I like to think that as I gave my wife a kiss and watched the first twinkling of the year, for a split second we were the city’s first big historical event of 2011. Thanks Dena, what a nice thing to say! I agree with Dena, great work. As always.